Montgomery County Business Development CenterSuccess StoriesHill & Markes Inc.
“We are delighted to have a new warehouse/office building in an excellent location for distribution throughout the state. We are equally happy to have a location that will allow us to retain our current employees.” – Andrea Packer, Vice President of Hill & Markes Inc.
Hill & Markes Inc. has been part of the Montgomery County business community for over 100 years. So when a recent growth spurt caused them to start looking for a new facility, Hill & Markes wanted to stay in the area. Amos Hill and Charlie Markes created Hill & Markes in 1906 as a candy, ice cream and cone distributor. Hill and Markes made deliveries by horse and buggy, and even by horse and sleigh in the winter months. 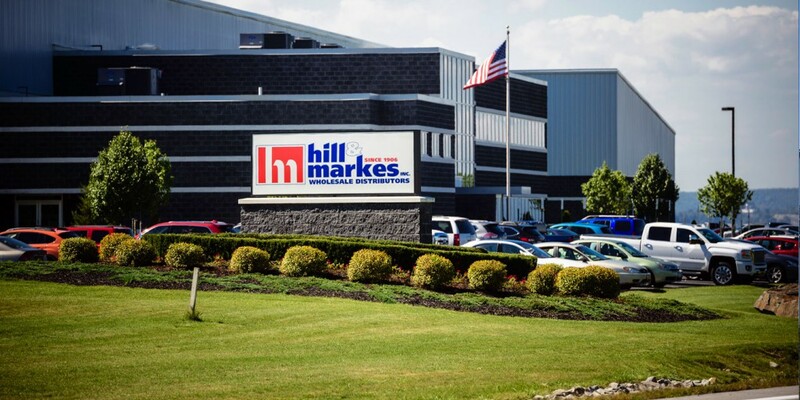 Today Hill & Markes distributes janitorial, industrial packaging, food service, ice cream, farm and office products as one of the area’s largest employers. Having outgrown their current facility in the city of Amsterdam, Hill & Markes turned to the Montgomery County Business Development Center for assistance locating a new space. Having over 150 employees, Hill & Markes needed to stay close to their valuable workforce and with the MCBDC’s guidance, chose to build a new LEED-certified, 125,000-square-foot facility in the Florida Park Extension. This site allows Hill & Markes to continue to grow, even providing room for future expansion.